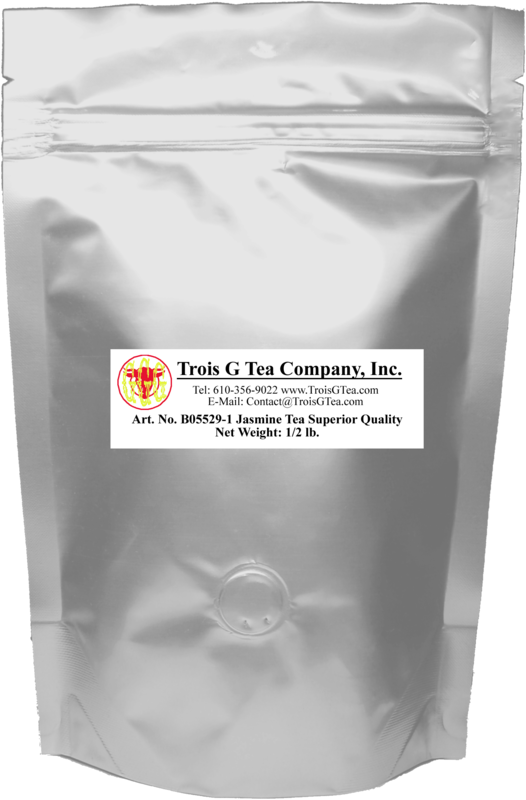 Trois G Tea Company, Inc.
Scented tea is a mixture of dried flowers with green tea, black tea, oolong tea or even Sencha tea. The flowers include jasmine, rose, osmanthus, orchid, plum, Lychee and gardenia with jasmine being the most popular. There are strict rules about the proportion of flowers to tea for their perfect combinations. Scented tea is sweet, pleasant and delightful to the palate. Fujian Province in China has long been famous for jasmine tea and rose black congou. 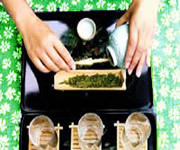 Jasmine tea is the oldest of all scented teas. By their nature, jasmine flowers open in the cool night air. Thus, they are plucked before noon, and kept aside until nightfall. Then, as cooler air arrives, the flowers begin to open, making a distinct popping sound. This signals that the blossoms are now ready to be blended, more romantically referred to as the marrying of jasmine and green. This is unquestionably one of the finest Jasmine Tea in interesting pearl shapes. The fresh jasmine flowers are picked during the summer day lights and set aside until evening when the petals begin to open. After Tea is enriched with the pleasant fragrance of jasmine flowers during in the cool night air, girls begin rolling each leaf with a bud into tiny pearl size balls. Once rolled, the tea is wrapped in silk mesh and dried by fire to set the form. Dragon Phoenix Pearl gets its name from the visual characteristics of the tea bushes ‘climbing’ the hillsides like a Dragon, and the beautiful young girls, chosen specifically to pluck this type of tea, give the appearance of dancing phoenix’s next to the Dragon’s long slender body. This tea is pleasing not only to the eye but also to the stomach. It unfurls and releases its heavenly scent during its brewing. Osmanthus Black Congou is a Chinese specialty, and is popular with its gentle aroma, delicious taste and mild peach flavor notes. 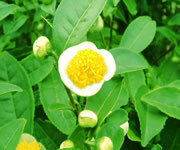 Moreover, it is also a rare herbal medicine, which is said to improve digestion. This tea is processed in a similar fashion to Jasmine tea. A layer of osmanthus blooms are placed between the black tea leaves and the delicate scent of osmanthus is allowed to permeate the tea. Following this, most of the osmanthus blooms are blended into the tea to enhance the visual appeal as well as boost the flavor. 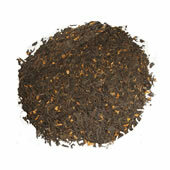 Interestingly, one of our customers names this tea as a “Devil Wood” Tea, which is much Americanized. Some traditional Chinese also use the fresh osmanthus blooms inside their sugar jar, making some floral tasting sugar. This tea comes from Fujian, China, the same place as famous Jasmine teas. ‘Congou’ pronounced ‘Kon Goo’ in English, from the Chinese word ‘Gong Fu’, which refers to the general way of brewing and drinking this tea. It is scented with fresh rose fragrance and produces a light, genteel cup with a pleasant aroma. The rose of the cup is much stronger than the taste. The rose petals, like Jasmine tea, are merely for decoration. By the time the tea is ready for packing, the petals have lost all of their fragrance to the tea. As the name implies, it is a delicate black tea romantically floating some rose petals during brewing –perfect for an afternoon garden party. Our Ginseng Oolong Tea is made from premium Oolong tea and licorice ginseng powder, whereas the Oolong tea leaves are compressed and coated with licorice ginseng powder, and shaped as tiny brownish green pellets. This tea not only produces a delicious and rich taste, but also nourishes your body and replenishes your energy. Its infusion yields a bright amber colored liquid. It creates a unique complex of Oolong tea taste with a very nutty sweet ginseng aftertaste. Jasmine Tea’s base is Pouchong, slightly less oxidized than oolong tea. As the tea is being dried with hot air, fresh Jasmine petals are covered on its top layer by layer. When the petals fragrance has been exhausted, the spent petals are placed in the base tea. Contrary to popular belief, the finest sweetest grades contain fewer petals. The world’s finest Jasmines come from the China province of Fujian. The cup has a smooth fragrance of a garden in bloom, with a liquor that is lightly sweet and very smooth. Premium Black Tea is scented with exotic Lychee (or Lichee, a common tropical fruit in South Asia) peels, which can be steeped and served in Congou (Kung Fu) style. After brewed, this tea yields a reddish brown hue with rich, full-bodied sweet fruity aroma. Interestingly, it goes well with sugar and/or cream, and even makes a chilled version of an excellent iced tea or bubble tea. The base tea of our Lychee Black Congou comes from Wuyi Mountains in Fujian Province of China. A dynamite tea with value!